Come on Lip what you scared of? If your going to go fishing go find a pond with some dang fish in it! Might as well catch some while trying the LSCR. Heck there’s no better way to test a rod reel and lure. If the weathers good, go catch a dang fish! You deserve it after so long. I would love to go to another spot but this one is only about 10 minutes from my house and it's an easy walk from where I park the van to the water. I have caught some fish in there before a few years ago so who knows there might be some still in there. Heck with all them golden shiners that I saw in there several years ago there might be a big one in there. I will check it out before I have to drive 45 minutes to another place. Got out and fished for a good 4 hours. Tried spinnerbaits, cranks, big worms, uvibes a jerk bait and paddle tail speed worm. The jerk bait was attracting the fish but they were not hitting it. Just curious. The. The big worm did the same. Watching the way they reacted told me maybe I needed to finesse them. I cut the paddle off the speed worm and tied on wacky. A small 3 and a half inch bait. Instantly caught one. Then the next one felt like a dink. My line swam and I set. It felt like a small fish then it gave a hard tug and my line went slack felt like the fish came off then bam the fight was back on. Got the fish half way to me and it head shake and the fish went one way my bait went the other. I looked on in disgust then suddenly she made a u turn swam back around and wacked my bait again this time I watched her swim away with it. Set the hook and got her up and out. Afterwards I caught another 2 and lost another smaller fish. I was using owner wacky hooks which are super sharp. Yet fish come off pretty easy. I think the hook is just so small it’s hard to get a good hookset on them. Great story Rick. That fish probably never knew it was hooked! Happened with the last fish I caught as well. That one got loose 2 times and the third time the hook stuck lol. 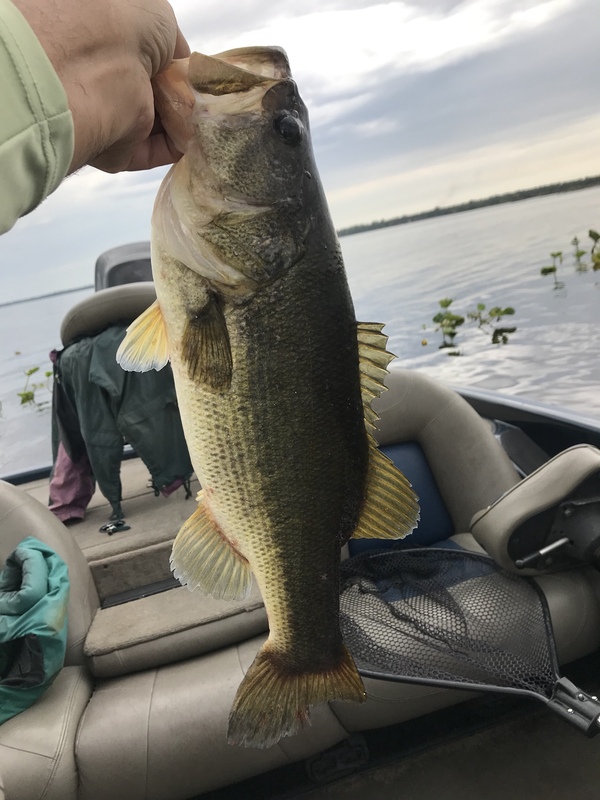 I've never had bass come back that many times after getting hooked. Nice story Rick and great looking Bass. What size was that owner wacky hook? I just got some 2/0 size ones and some O-Rings so I could try wacky rigging this year. At least you got some bites and several from the same fish! Must be the new Berkly Bass Attractant stuff your using as Aftershave. They are sticky as heck but I think 2/0 would be better. I use it as body wash too. The 2/0 Qwner are the ones I got. Had my best day in quite some time. Didn’t start that way. I had 1 fish by 2:00. Kept grinding away then hit a stretch where I boated 3 and missed a couple. Funny thing is I have fished off and on here for years and never saw this spot before. Kind of hidden in the open. My smallest today was about 2 lbs and the biggest just shy of 4 lbs at 3 lbs 13 oz. Best of the year so far. Felt good. Rain just wouldn’t let up. Was on and off all day. Nice fish, Fred. Look like they could be post spawners feeding up. Way to go Fred! Good to see you catching some better quality and quantity fish! It's been a while but maybe this will kick start you back up. Sometimes we just go through slumps. Nice work Deadeye. Looks like you had good day even though you had to dodge rain drops. Sure hope so. Been a long dry spell.